During his recent visit to the Philippines, the United States Secretary of Defense promised delivery of a variety of sensors and communications equipment worth $42 million to the host nation. One of the critical sensors in this suite is an observation blimp that can peer across the South China Sea (SCS), providing maritime domain awareness to the Philippines. The Philippines is one of several claimants to sovereign rights over few SCS islands; they are faced with a coercive China claiming such rights over 80 percent of the sea. China has forcefully seized control of maritime features in the SCS from both Vietnam and the Philippines. In addition, the PRC has started land reclamation projects and built artificial islands. Radars and missile batteries have been installed on some of the features, and military planes operate and land there routinely. A network of sensors established in and over the SCS would enable monitoring of land reclamation activities, build up of military assets on the islands, transits of coast guard and maritime militia units, oil exploration rigs, and any other object that can potentially fly or sail as China has become innovative in asserting its claims. The communications equipment offered to the Philippines will enable secure transmission of data from these sensors for faster and more transparent decision-making. One of the critical sensor nodes in this suite is an observation blimp that can peer across the SCS using onboard radar. The blimp is a powered, gas filled lighter-that-the-air airship. It does not have a rigid structure like that of a balloon, but can instead be steered while floating in the air. Hindenburg is a famous example of these airships, which had a rigid structure. 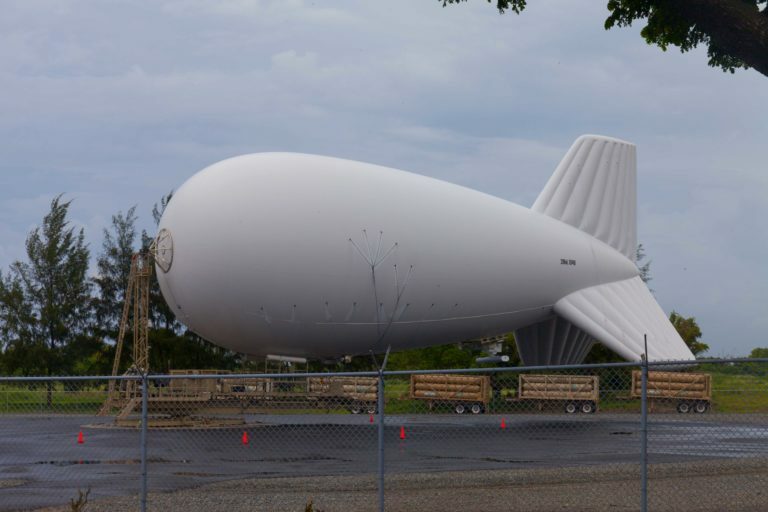 The potential of airships to provide constant mass area surveillance renewed military interest in them. Airships were useful to coalition forces in Afghanistan, forces along the US-Mexico border, and by Israel over Gaza, just to name a few. 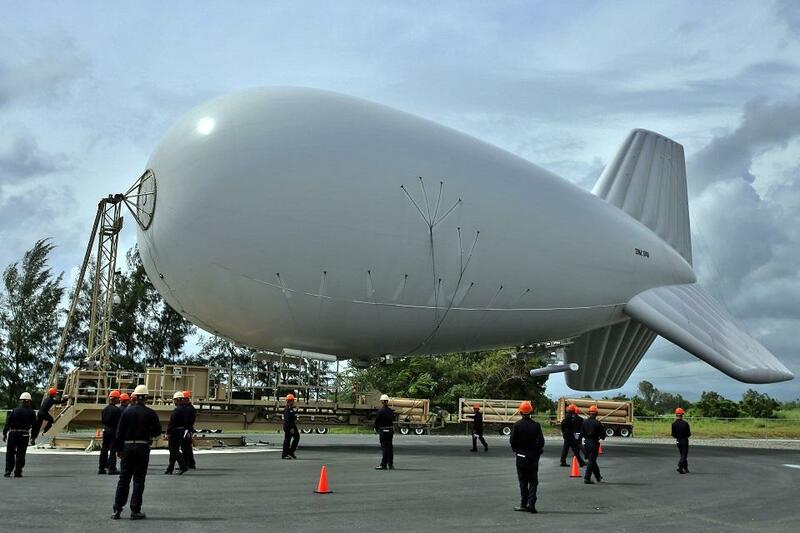 The PN's first Tethered Aerostat Radar System. Due to obvious reasons, MaxDefense won't identify the location. Photo exclusively shared to us by one of our MaxDefense Community member contributor who wish to remain anonymous. The turnover ceremony will be led by US Embassy in Manila’s Deputy Chief of Mission, Michael Klecheski, and PN flag-officer-in-command, Vice Adm. Ronald Joseph Mercado, at the Naval Education and Training Command in San Antonio, Zambales on Tuesday. Navy spokesperson, Capt. Lued Lincuna, said the TARS, a self-sustained, unmanned lighter-than-air systems, would enhance the PN’s capability in maritime intelligence surveillance reconnaissance by effectively detecting maritime and air traffic within the country’s coastal waters using sensors. Manila, August 23, 2017 — Col. Ernest C. Lee, Chief of the Joint U.S. Military Assistance Group in the Philippines, formally transferred a new 28M Class Tethered Aerostat Radar System (TARS) to Flag Officer in Command of the Philippine Navy (PN) Vice Adm. Joseph Ronald S. Mercado in a turn-over ceremony at the Naval Education and Training Command (NETC) in Zambales on August 22, 2017. Vice Adm. Mercado was the guest of honor and keynote speaker, and U.S. Embassy Deputy Chief of Mission (DCM) Michael Klecheski also delivered remarks during the turnover. The 28M Class TARS is a self-sustained, rapidly deployable, unmanned lighter-than-air platform which can rise to an altitude of 5,000 feet while tethered by a single cable. Sixteen Philippine Naval Information and Communication Technology Center personnel are engaged in a rigorous six-week training program at the NETC in Zambales to learn assembly, handling, operation, maintenance, and troubleshooting for the TARS. These sixteen students will become instructors for the next class of operators. Through this donation, the PN is poised to enhance its capability in Maritime Intelligence Surveillance and Reconnaissance by effectively detecting maritime and air traffic within the country’s coastal waters using sensors. Moreover, it will also be utilized in Humanitarian Assistance and Disaster Response (HADR) operations. The TARS includes a weather station that provides telemetry data for the monitoring of ambient temperature, pressure, wind speed and other pertinent parameters to successfully operate the system. The NETC in Zambales is the staging point for the TARS as it is the largest PN base with flat terrain, and fits the minimum requirement of 300 square feet for the launching of the system. 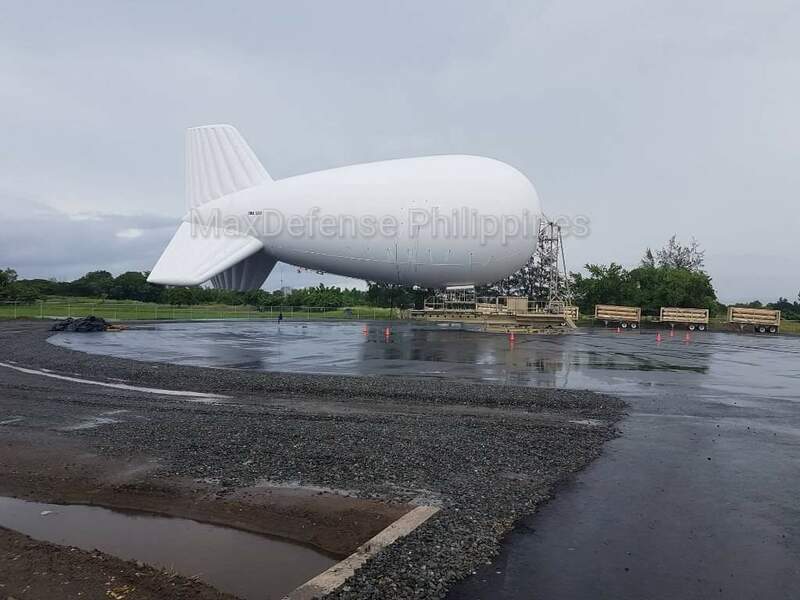 The 28M Class Tethered Aerostat Radar System (TARS) at the Naval Education and Training Command in Zambales. 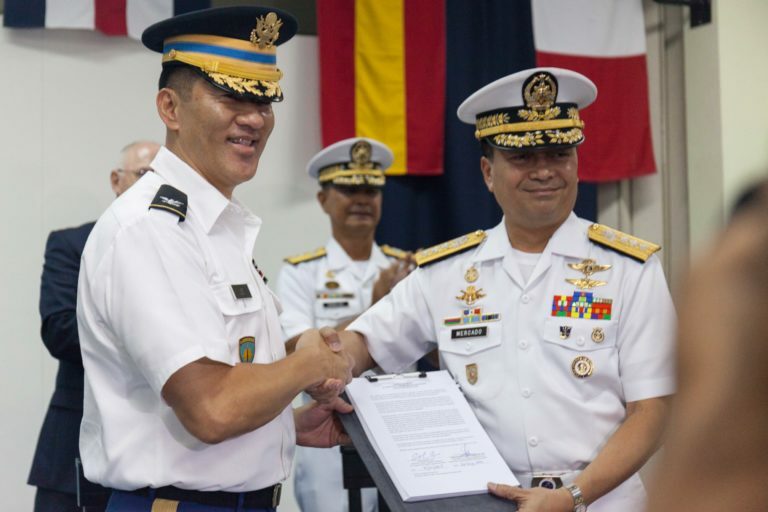 (L-R) Col. Ernest C. Lee, Chief of the Joint U.S. Military Assistance Group (JUSMAG) and Vice Adm. Ronald Joseph S. Mercado, Flag Officer in Charge of the Philippine Navy shake hands after signing formal turnover documents giving the TARS to the Philippine Navy. ^ Whats with the "ah well" ....Is that a good thing or a bad choice? The advantage of the TAR is persistence (subjected to weather), as opposed to a fuel/range constrained platform. They can even function as OTH communication node, targeting platform etc..
Sticking a commercial radar on it... well it does the job and u get better range out of it, being able to peer over the horizon, but more could be done. How can you tell? All we can see from the available pictures is the antenna. Further, the sensor platform is pretty flexible. It sometimes has the EO ball attached and sometimes not. Neither can you tell what other communications antennas are attached, much less visible. ^ Well, That could only mean that the US still doubts the AFP's capability to maintain and or secure high tech gears that were supposedly installed on that TARS, or.... maybe they think that, all we need is to see whats out there?